RABBITS AND REDWORMS- Sustainability Above and Below! Raising rabbits and worms together works so well because the nutrients in rabbit droppings and the wasted rabbit food and hay contains the perfect mix as a food source and as a bedding for the worms. You can also raise the worms in compost bins or vermicomposting bins using the rabbit manure as a top dressing, for worm feed, and also as a worm bedding. Keeping worms under the rabbit cages also allows you to raise worms for fishing bait, chicken food, vermicomposting and this adds another bartering item you have on your homestead. This helps you to produce another potential source of income from your homestead and also improving your sustainability and another great fertilizer for your gardens. Growing worms with rabbits is easy, I am in no way a worm expert. This post is what works for me in my rabbitry. I have found that the best kind of worm to use under rabbit cages is the red worm or Eisenia fetida. They are also known as brandling worms, manure worms, tiger worms, panfish worms, trout worms and many other names. But whatever you call them, they are the best choice of worm for under your cages and for composting. I started by building my worm beds underneath my existing rabbit hutches back in the early 80s. I dug a trench under the hutches extending 6 inches out from the cages on all sides. Digging the trench about 12 inches deep to make my beds. This worked fine and I raised MANY worms for fishing bait using the trench system. 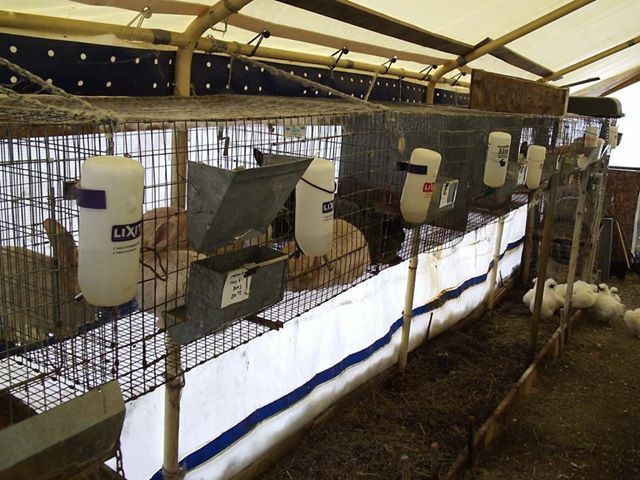 The rabbit cages should be at least three feet above the worm beds. I have also constructed beds under hutches and cages from 1x12s or 2x12s and putting them on their sides and screwing together to make a raised worm bed under the hutches. This can be built very inexpensively as the wood frame can be made from scrap lumber or pallets. Just try to make the worm bed about 12 inches deep. Remember to make the worm bed itself about four to six inches wider than the hutch or cage area to catch all the rabbit droppings, urine, and wasted feed. You can use the pit or trench system as mentioned earlier. It is best if you can add a base layer of sand or gravel for drainage this is weather you are using either the trench or raised bed method. Placing 5 to 6 inches of bedding material in the bottom of the worm bed is sufficient for starting the worms. I use a mix of carbon type materials such as shredded paper or cardboard, leaves, hay, straw, and peat moss. Most worm growers prefer peat but I like what I can get around the homestead for free. I have found that the worms will general only use the top 6 inches of bedding unless certain circumstance’s make them go deeper, such as cold weather. Moisten the bedding with water and let your rabbits do their thing until the surface is covered with 1 to 2 inches layer of rabbit manure. Mix the rabbit manure and bedding material together and wet it down. Rabbit manure is considered a cold manure, but by mixing the carbon and nitrogen materials it will generate some heat due to the natural composting processes, so keep mixing the bedding and lightly water it once a day for about 2 to 3 days. On the third day, do the hand test by putting your hand into the bed to feel for heat. If the bedding material is hot, keep mixing it once a day until the heat is out of the bedding, Make shure it is cooled before you begin adding your worms into the beds. When the bedding is cool to the touch, you can add your worms. They should disappear immediately into the moist bedding material. When starting the worm beds you should begin with 200 to 300 red worms per square foot of surface area. You can add less worms, but they will not work as effectively at turning the manure into compost. But they will reproduce, and soon you will have pleanty. If you are raising the worms to sell, do not use more than 200 worms per square foot to allow the worms enough nutrients, room, and food to grow large. People will be lining up for you large trout catching worms! Worms cannot eat dry, rabbit manure, you will need to maintain a moisture level so the bedding is just damp enough to squeeze out a drop or two of water when you squeeze it. Sprinkling the beds with water a few times a week will help to keep the bedding moist, but remember to skip by the areas under the automatic drinking valves, water bottles, or water crocks as they are usually already wet enough. In the summer time, you may have to water once or twice a day if the top of the worm beds dries too fast. 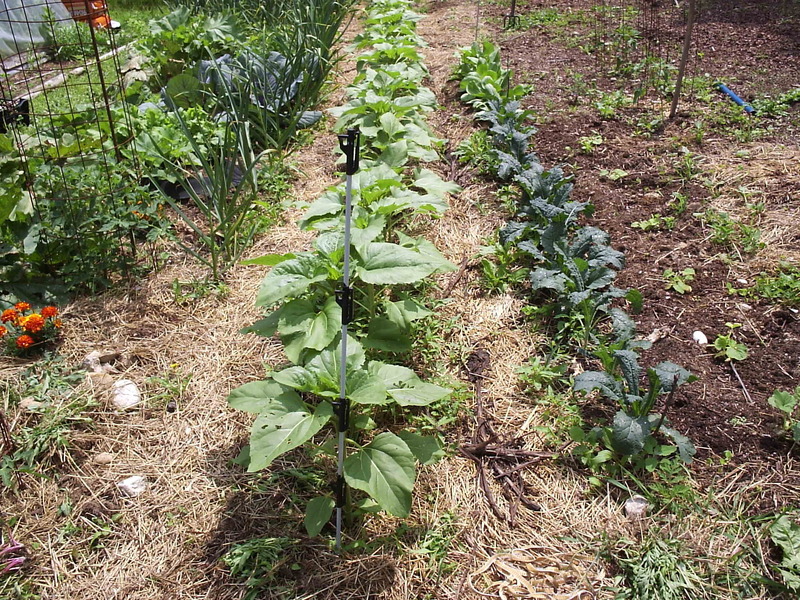 To maintain the worm beds you should add an additional inch of leaves, straw, or hay a few times each month and mix the beds with a pitchfork from top to bottom to avoid packed bedding. I will remove the urine spots from the worm pile with a shovel about once a week. This prevents the beds from getting too salty and hot for the worms. I add this urine soaked bedding to my compost piles. Leaving the urine spots in the worm bed eventually leads to a bad odor and insect problems. After about six months you can start harvesting worms and saving the great fertilizer your rabbits and worms have made. I do this about once a year, I will remove half of the bed, save some worms and add the rest to my gardens. Then add new bedding just as you did when starting a new bed. Over the next few weeks the worms will move to the new bedding, and the old compost can be removed and sold, bartered, spread over a garden, or set aside to use later. Do not harvest any worms for at least a few days after harvesting, and be sure to check the temperature and moisture conditions the following day. If the material is too dry or is heating up, water and mix again for the next few days. If you plan to use your worm castings as a soil amendment, make sure that the castings are kept slightly moist and protected from sun and bad weather when storing. Poor handling, such as storing in areas leached by rainwater, will result in a loss of the nutrients. Red worms are hermaphrodites meaning that each worm is both male and female. It still takes two worms to mate as they can not reproduce on their own. When a red worm is sexually mature you will see the bulbous gland around its segments this is called the clitellum it looks like a swollen band about a third of the way down the body. It takes 3 months for a newly-hatched red wriggler to attain sexual maturity. Adult red wigglers secrete a number of egg cocoons after mating, and after an incubation period of about 21 days, between 4 and 6 juvenile worms hatch from each cocoon. The cocoon is a small yellowish grain almost looking like a grain of rice. As soon as they are hatched the worms are ready to start their diet of rabbit poop. The hatched worms first appear as a tiny thread like white worm. After about 8 hours they start to gain their hemoglobin and change to a pale pink then turning to a brick red color. It takes up to four months for a healthy and well-fed red wiggler population to double in number. Vermicomposting is the process of using worms to convert organic matter to compost. This process is as old as time. This is happening in the forests and pastures every day naturally. By using worms under your hutches you are creating a controlled system of vermicomposting and you can harvest the worms for bins and the awesome worm castings. One of the greatest pioneers in vermicomposting was a Michigan biology teacher Mary Appelhof who started the idea of home vermicomposting. In 1972, she realized she wanted to continue composting in the winter months despite living in a northern climate, she started with 1 pound of red wiggler worms, or Eisenia fetida, from a bait dealer. She created a shallow bin in her basement, loaded it with bedding and added her food scraps. By the end of the winter, they had consumed 65 lbs. of garbage and produced worm compost that resulted in impressive vegetables in her garden. Her book “Worms Eat My Garbage” Is a must have book for the homestead library! This is a great way to continue your soil production through the winter months. I have a few bins in my basement for holding my worms and composting in the winter, this is my added insurance in case all my outside beds die off in the winter. I have mentioned using your worms as fish bait and vermicomposting, But remember your chickens LOVE worms! It gives them a great protein intake. I sometime have problem’s with my Silkies digging up the beds and eating lots of my worms . You can harvest a few worms and toss them inside the coops or runs for them to eat off the ground, or put them in bowls. But there’s also a better way to feed worms to chickens. You can choose to dry them, and then grind or crumble them. You can dry worms by placing them under an electric light bulb, in a oven, or inside a greenhouse. When they’re dry they are ready to be crushed or ground up, you can then add the crushed worm pieces as an additive to your usual chicken food supply. By drying the worms they are easier to save as a winter food source. Red Worms as a organic chicken feed can be a good idea for you to promote on your homestead. Even to sell and saving you money on chicken feed. Worm is about 80% protein. Rabbits love black oil sunflower seeds (BOSS). They are a great winter tonic! I only feed BOSS to my rabbits in the cooler months, as it is a high calorie, high fat, “hot” feed. So it keeps them warm and shiny, great for a dry winter coat. This helps by putting the oil back into their coats. I am talking about the black oil sunflower seeds, not the striped seeds. The striped seeds have thicker, tougher hulls. Black oil seeds have thinner shells and are more nutritious. Black oil sunflower seeds contain high levels of protein are rich in vitamin E, linoleic acid and provide a good source of fiber. 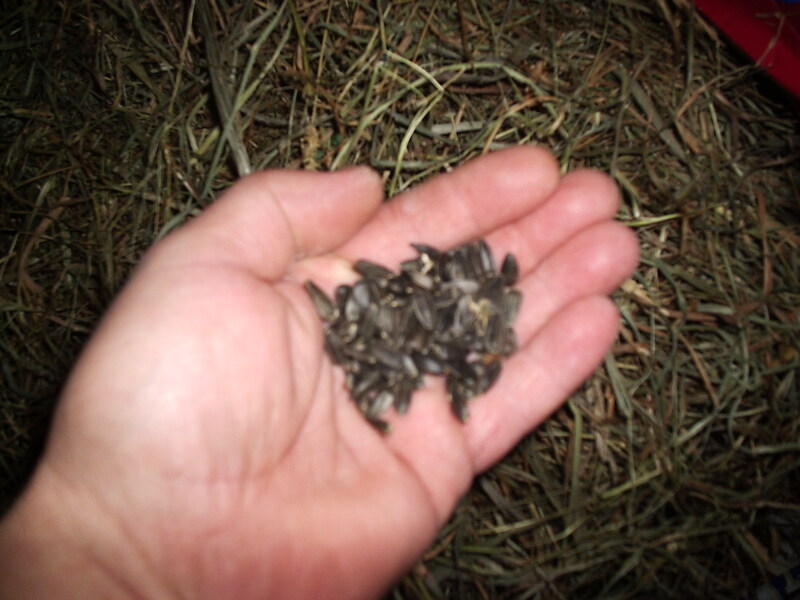 Rabbits benefit from this snack seed as a high source of energy during cold temperatures. I do not recommend using BOSS during the heat of the summer (June, July, and August here in Maine, it may be longer in your area). I feel that if fed during hot weather it will make them shed more and could cause gut troubles by hair blockage. But if you have a rabbit that is stuck in a molt, then this is a great additive to add to your rabbits diet. By adding the extra calories and protein this will get them to blow their coat and get in new growth. If rabbits are overfed BOSS or fed to often this can also trigger a molt so feed in moderation. This is used as a tonic not a feed! 28 percent fat – Fat in a rabbits diet functions as an energy source, aids in the absorption of fat-soluble vitamins (A, D, E and K). It also adds luster and gloss to the fur and helps slow shedding. 25 percent fiber – This helps provide the bulk and forage requirements for a rabbit and also promoting a healthy gut. 15 percent protein – Protein is need for the growth, disease resistance, milk production, general health and reproduction. Calcium – Calcium plays a key role in bodily processes, such as heart function, muscle contraction, coagulation, and electrolyte levels in the blood. But you do not want excess calcium in a rabbits diet as this can cause urinary tract problems. B vitamins- A rabbit produces its own b vitamin by bacteria in the hind-gut of the rabbit, their requirements are fulfilled through caecotrophy. So B is not very important to a domestic rabbit. Vitamin E – helps to remove toxins out of your rabbit’s body this helps to maintain the immune system. Potassium- Rabbit need this when they’re sick as they lose potassium through watery feces. Feeding rabbits BOSS- Rabbits should only be fed BOSS as condition mix or tonic treat, 6 seeds per a rabbit top dressed in the feed hopper or crock is enough! DO NOT OVERFEED! You do not want fat lazy rabbits. Feed with the hulls on this is a good added fiber for the rabbits digestive track. Some show breeders feed BOSS as a daily conditioner one week before a show. I do not think you should add them to a bulk bag of feed because you will not be able to control the amount of BOSS each of your rabbits consumes. Black oil sunflower seeds are not a complete source of nutrition for your rabbit, offering only a few necessary nutrients your rabbit needs. These should only be offered as part of a rabbit’s diet, not the sole source of nutrition. Vitamins A and E are vulnerable to poor or prolonged storage in feeds. Both of these vitamins are needed for the willingness and ability of rabbits to breed. Instead of increasing the pellets, I suggest feeding about a tablespoon of black oil sunflower seeds for Vitamin E and a good handful of dark leafy greens (dandelions, plantain, raspberry,and Kale are fine) for Vitamin A. If the rabbits have never had greens, start with just a couple of leaves and work up to more to help with those unwilling does. One of the things I like about the BOSS is that even rabbits who are “off their feed” will nibble at them. When I got my first Angoras many years ago I tried adding BOSS to their diet and the results could be noticed by coat growth and quality, I can only assume it is from more protein-rich foods. Coat growth in Angoras or any wool breed uses a lot of protein to keep the fiber growing having a little extra to burn is making their fiber thick, dense, and soft. PROS- They are packed with nutrition, amino acids, and calories, so they are a great supplement for almost any rabbit to one degree or another. They do help with shiny coats also. The side benefit is the volunteer sunflowers that sprout. I grew some out this summer (Will be growing a plot of the in 2013) and saved the seed heads, then pulled the plant and gave it to the rabbits as a green treat in the cages. They would not only eat the leaves, but they would gnaw the stems until it was all gone! CONS- Not to many, but possibly too high in protein and calories, which could cause heat issues during summer months. If fed too much too often maybe some weight gain, and molting problems. I believe the positives of BOSS out weight the negatives. Definitely feed with shells as they add necessary fiber and are easy to chew through for rabbits. Black oil sunflower seeds often stimulate your rabbit to gain weight due to their high fat content. This extra body weight helps rabbits maintain their body temperature in the winter, fall, and spring months. Your rabbit may not need to maintain as much body heat in the summer months, so consider cutting back the amount of black oil sunflower seeds your rabbit consumes during those months. Hope this answers any question on feeding BOSS to your rabbits. If anyone has other ideas or question please post in the comment section. Will be working on a conditioning mix post for rabbits and BOSS is in to that mix. Also if there are any requests for new post and ideas, email me and let me know! JOIN THE RABBIT REVOLUTION! Like Us On Facebook, and subscribe to the web page to get updates as the are posted. Domestic rabbits are descended from European wild rabbits and should have no problem with a non-pelleted diet that includes a variety of feedstuff. Older rabbit books are useful sources of this information. Let’s face it, pellets only came on the market after World War II. If you are feeding pellets, I suggest you contact the feed company and ask for an ingredients list. Not just a nutritional breakdown, but a list of the actual items used. You may be in for a surprise. I was! Some years ago I asked for this list from one of the big-name feed companies that made it. I was shocked to find animal tallow among the ingredients, also listed was animal flour and animal fats. Rabbits are herbivores that eat mostly green food, grain and roots. Now what does a herbivore want with animal tallow, animal flour, and animal fat! I looked into it more and found that GMO grown grains and soy were also used in rabbits pellets. So now in most brands of rabbit pellets they include the GMO grown soy mill waste products as the main feed ingredient. So I began to learn about feeding my rabbits a more natural type food program. By experimenting and watching the rabbits I have learned a lot, not all good! The rabbits are the best teachers and they teach you a lot. During the growing season, nature makes my rabbit food! I am not knocking all pellets, some pellets are better than others and if you choose to use them just be informed. But there are alternatives if you are willing to learn. Most rabbits if given a choice prefer the hay and greens and will eat far fewer pellets. I have done this test myself and the feeder was always full of pellets when they had the option of a natural feed source over pellets. Where fryers are concerned, you will need to adjust your expectations slightly. Rabbits fed mainly on natural foods will grow a bit more slowly than those fed only pellets and may take a couple of weeks longer to reach butchering weight. But your overall cost per pound will be less and the fryers should have more meat and less fat. I think the reason they grow more slowly is related to protein levels, which are higher in pellets than in a diet of hay, greens and grain. Most of us started homesteading because we wanted to take control of what goes into the meat and other food that we eat. While it’s a whole lot more work, I think the only real way that we can do that is to completely ditch commercial mixtures and make or grow our own animal food from scratch. I truly think that feeding a variety of different foods is what is going to work in the long run, not some commercially prepared mixture based on some scientific guidelines which may or may not be accurate for the animals we are raising. Natural feeding saves money but is more labour intensive. I like to save money, but I think my real motivation is the health, happiness and well-being of the rabbits. I am convinced it is very best for the health of the rabbits. Some of the results are the absence of digestive problems (No gut stasis or weaning enteritis! and the wonderful flavour of the “grass fed” meat). I have never had a rabbit that really loved pellets! Rabbits lead boring enough lives as it is, (unless they live in a colony setting more on this subject in a future post!). 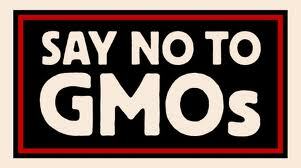 Why deny them the pleasures of fresh, varied, natural foods! I now feed a combination of natural and pellets. If the source of natural food is good and fresh, it will make up for short comings in the pellets. I would just feed a natural diet if i had less rabbits and more time. I would like to stress that this method of feeding, was the only way to feed rabbits before pelleted foods were invented, it is frowned upon in today’s world and considered controversial by many. I have been getting very good results with it, but I am still always learning buy the best of teachers, the rabbits themselves! I have nothing but my own experience and some old books to base this on. If you wish to use this method you must expect to be vigilant and adaptable while you are learning what works with you and your rabbits. I know that lots of people are going to choose to supplement with natural foods rather than feed them exclusively. There is nothing wrong with this, I do this myself. I feel it gives the rabbits the best of both worlds. I also think each breeder has to find what works best for themselves and their rabbits. Remember the sustainability of a natural food program may be the only way to feed your rabbits one day. So by just supplementing now, you will learn what works, how to grow, how to harvest, how to dry and store (for winter use) all the while getting your rabbits gut flora adapted to this “new” diet. Rabbits digestive systems are perfectly capable of digesting the greens, but they must develop the proper flora in their GI tract and that does not happen overnight. Make your transition to greens gradually, working the amounts up from a few leaves to as much as you can find for them. In the wild, rabbits eat greens from the time their eyes open and suffer no ill effects. The greens are always fresh since they are growing when the rabbits eat them and because there is always more there is no tendency to overeat. I usually transition new rabbits over a period of two months. Most rabbits, given the choice, prefer the hay and greens and will eat far fewer pellets. Grass hay can be added immediately with no problems and should be offered at all times. It is really good for their digestion and will help prevent weaning enteritis in fryers. Foods during warmer months include a variety of sedges, grasses and other herbaceous plants. Important species include panic grass, plantain, dandelion, crabgrass, ragweed, croton, clover and lespedeza. Agricultural crops eaten during the summer include clover, alfalfa, soybeans, peanuts (the green plant) and garden vegetables. Winter foods include honeysuckle, lespedeza, blackberry, greenbrier, a variety of grasses and dried vegetation. Bark, twigs and buds from sumac, black cherry, willow, holly and dogwood also are eaten. Agricultural crops consumed during the winter include rye, wheat, alfalfa, clover, corn, peanuts and ryegrass. Wild rabbits have been known to damage fruit orchards by eating the bark of fruit trees. Buds of seedlings in pine plantations also may be eaten during the winter. Consider a day in the life of a wild rabbit. they would spend 70% of their time above ground searching out and foraging for food while keeping an eye out for predators. As a ground feeder, a rabbits diet would be mainly made up of grasses, hay, herbs and bark – all high fibre foods! Rabbits can not climb trees to get fruit, and they would not actually go around digging up carrots either. The rabbits territory would be around 2+ acres, meaning they would get a lot of exercise every day searching out food across that area. The rabbit’s whole existence has evolved around this high fibre diet. Rabbits from different areas eat different diets they ate what was available in and around their surroundings. Marsh rabbits would feed on leaves and bulbs of marsh plants including cattails, rushes, and grasses. They can also feed on other aquatic or marsh plants such as centella, greenbrier vine, marsh pennywort, water hyacinth, wild potato, and amaryllis. Marsh rabbits make more year-round use of woody vegetation than other species of rabbits. The swamp rabbit eats reeds, plants, and grasses native to its marshy habitat. The Brush Rabbit feeds mainly on grasses and forbs, especially green clover, though it will also take berries and browse from bushes. The desert rabbit mainly eats grass, but will eat many other plants, even cacti. It rarely needs to drink, getting its water mostly from the plants it eats or from dew. So take advantage of what type of area you live in and feed your rabbits accordingly. When the rabbits are in cages and dependent on people, the chances of problems increase. Most rabbits, will get used to eating greens over a period of a few weeks, they will not overeat or have problems digesting the greens. If you go slowly, feed some of the regulators (plantain, raspberry, strawberry and blackberry leaves) along with the other greens. (think salad bar) Always clear out any uneaten greens and you should not have any problems. However, it is good to keep in mind that rabbits, like people, can have individual sensitivities and tastes. Even people in urban areas can grow rabbit food! Grow in containers, on balconies, in windowsills and you will be surprised how much you can grow. See if there is a community garden in your area, and if there isn’t one, maybe you could start one! Local schools would be thrilled if you started a project for kids to start a garden and grow their own food. 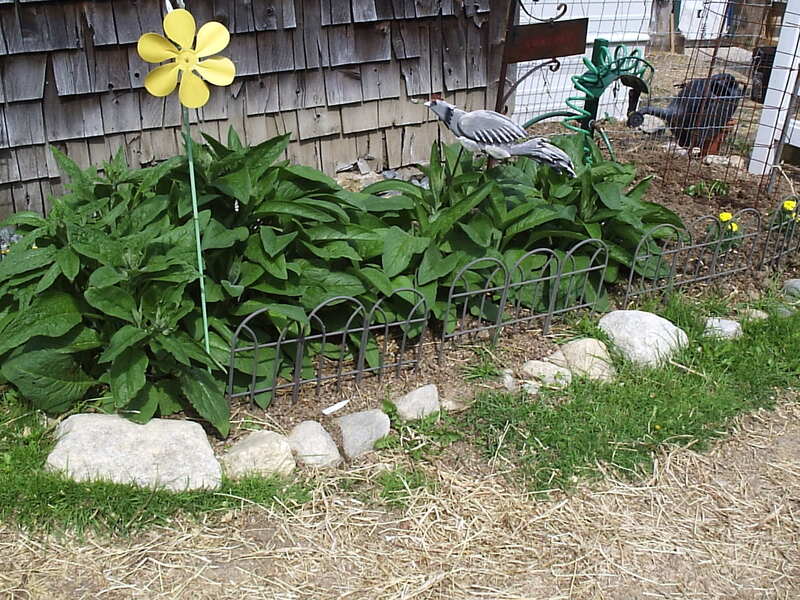 You could incorporate a herb and weed bed to attract beneficial insects and feed your rabbits! I’ve never heard of a rabbit over-eating on grass hay. Hay ( like timothy/clover ) is the foundation of the rabbits diet. 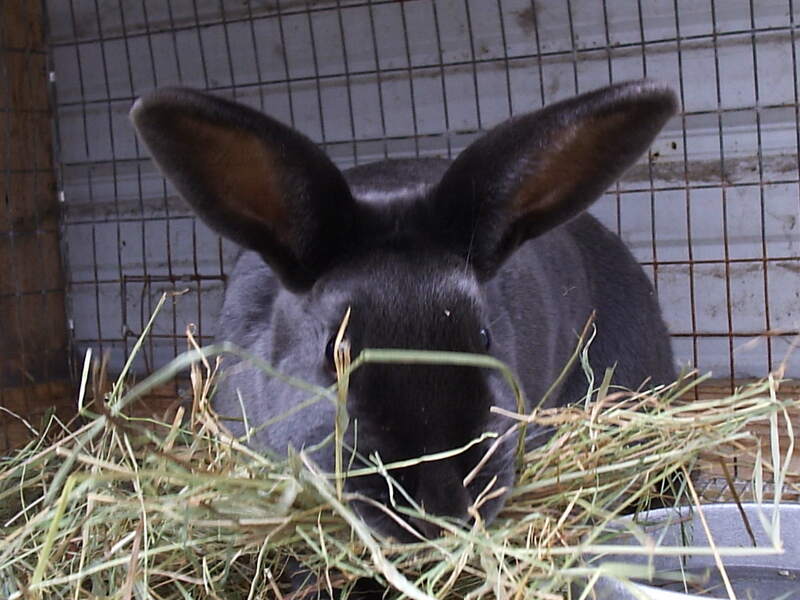 Grass hay is very good for rabbits for GI tract health. It is not so high in protein so if you are feeding pellets, this is the best hay to use. Hay is used as fiber and keeps things moving fast thru the GI tract. I would be more careful with alfalfa hay however as it is much richer. When I am feeding alfalfa hay in winter, they get a limited amount of alfalfa hay and as much grass hay as they want. I know a lot of people say not to feed fresh alfalfa or alfalfa hay because it is “too rich” but if you are not feeding pellets or have cut way back on the pellets, alfalfa becomes a valuable food source. After all, it is a major ingredient in many brands of pellets, so why be afraid to use it. Feeding alfalfa and clover is probably the most controversial aspect of feeding rabbits naturally. Legumes are high in protein and calcium. Because there is already a lot of alfalfa in the pellets, when feeding a combination it is possible for the rabbits to get too much protein and calcium. Excess calcium can result in “bladder sludge” as the unused calcium is excreted. Drying alfalfa and clover is supposed to help, I suggest, however, keeping the amount of these two excellent greens down or not at all if you are also feeding pellets! The rabbits certainly get more hay and less green feed in the winter. In the winter I grow wheat and other grain grasses (under lights in the house), I pot up some chard, make sprouts and also feed a lot of dried greens for them (that was harvested during the spring and summer months). Just as wild rabbits adjust their diet as winter comes and eat a lot more dried grass and tree bark and buds and less grass and weeds, so do my rabbits. If you have a lot of rabbits it really is going to be hard to grow enough. You may also be able to harvest some of your homegrown wheat or barley as hay, just as it forms the seed heads and store for winter feed. The difference between grass and hay is Grass is usually cut green and growing- So it is low in fiber and high in protein. Hay- (especially legume hay) is often cut quite mature to maximize production and the mature grass is higher in fiber. Legumes like alfalfa are also stemmy. But hay will be lower in vitamins compared to fresh grass. Timothy hay is great for GI health and for nibbling pleasure but it does not have very much protein compared to alfalfa or clover hay. You may find you need to continue feeding some pellets to supply enough protein unless you can find some alfalfa or clover hay. A mix of alfalfa with timothy is great. If you are not feeding pellets, however, the rabbits have to get their protein somewhere else and this is where alfalfa or clover hay comes in. You don’t really want to double up on the protein, so it is not so good for pellet-fed rabbits. Rabbits can live on good hay alone, fed free-choice. I don’t recommend it, but it provides a baseline for planning. In winter, some grain is a good idea. I found that the does needed it when they are lactating. The dried greens are great for the rabbits they provide variety and interest and lots of nutrients. I think if you dry the same quantity that you feed fresh that seems as good a way of estimating as any. Don’t forget that you can also feed windowsill greens to the rabbits this will be another food source if you start to run low in late winter. Grain grass is the easiest and very fast-growing you can cut it several times before it starts to get straggly. Vegetables should be introduced one at a time if your rabbit is young. Monitor their droppings to make sure that they can tolerate what they are eating. If you notice any changes, discontinue feeding that vegetable. Make sure your rabbits vegetables are always fresh. If it smells “off” or if you would not eat it yourself, throw it out. Greens and veggies could cause a problem if fed in massive quantities-the rabbit is a pig by nature-if the uneaten greens are allowed to wilt and spoil-if fed in too great a quantity when the rabbits are not accustomed to it. Organic vegetables are ideal for rabbits since they are so sensitive to pesticides and chemicals used on commercial produce. Whatever you choose, be sure to wash it thoroughly and pick it over for bugs. A great variety of vegetables exists and most can be found in your local grocery store. (But remember we are going for sustainability so grow it or hunt for it). Dark, leafy greens should be fed at least once a day. Carrot tops, watercress, radish leaves, collard greens, beet and turnip tops, romaine lettuce, red and green leaf lettuce, endive, chard, and dandelions are some of the most popular (avoid dandelions or other safe feeds picked from roadsides or unfamiliar yards you do not want to give your rabbits a fertilizer or pesticide cocktail). Other vegetables such as Brussels sprouts, broccoli, tomatoes (without stems! stems and leaves of the tomato plant are toxic to rabbits), sugar peas and fennel. 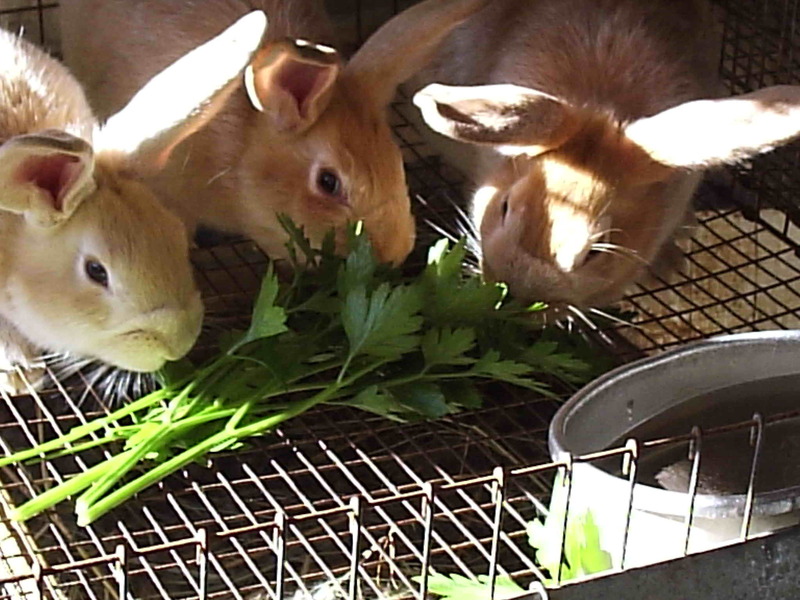 Rabbits especially like fragrant and tasty herbs like parsley, cilantro, basil, dill, arugula and mint. You can dry most of the greens mentioned. Yes, they wilt but then they dry like hay would. Once thoroughly dry they will keep through the next winter. This really helps for winter feeding. Daily vegetables are a vital source of nutrition for your rabbits. Amounts fed will vary by the rabbit’s size, weight and preference. Some people feed vegetables both in the morning and evening, others alternate meals of pellets and vegetables. Some people mix a variety of veggies together like a salad (i do this), some feed one vegetable at a time. Mangel beets should be stored before feeding, the old books say never the tops of the mangels for rabbits and never before Christmas. Feed mangels in moderation. Mangel beets, sugar beets and garden beets are all useful for feeding rabbits and are a great food that stores good for winter feed. Plantain and blackberries. Both great as food for rabbits, both good fresh or dried and both an excellent remedy for diarrhea. Plantain is one of the very safest greens for rabbits and even young kits can eat it. I’ve dried raspberry leaves on the cane and it works well, but i think it might be better just to cut off the leaflets. The thorns on the blackberries are truly vicious. I highly recommend red clover in a rabbit greens garden. You can get an awful lot of greens off a small patch and in season it recovers from a cutting in no time. and also dry and save the seeds. Many plants contain a naturally occurring chemicals called an alkaloids, which are mild toxins that protect plant in the wild. The one most talked about with rabbits is oxalic acid and it is completely harmless to animals or humans when consumed in small amounts. The amount of oxalic acid within each plant can vary significantly due to several factors including the composition of the soil the plant grew in, the time of year and the age of the plant. Most of the fresh vegetables we feed rabbits have a low to zero level of oxalic acid, but a few, most notably parsley, mustard greens and spinach, lambsquarter,comfrey have relatively high levels. (Note that kale, which is often implicated as a high oxalate food is actually very low in oxalates when young). The toxicity of oxalic acid comes with feeding large quantities of foods high in this chemical and can cause damage to the kidneys over time. These foods are nutritious and should not need be excluded from the diet if you feed them proplery.These vegetables should be fed moderately as they are high in vitamin A (that a rabbits needs!) I recommend feeding a minimum of at least 3 types of leafy greens a day (and only one of them should be from the group listed above) Don’t feed the same greens all the time from week to week if possible, mix it up. For instance if you feed parsley this week, then leave it out of the diet for next week and use something else. Rotating the greens will also give your rabbits better all around nutrition! Now that your rabbits are accustomed to greens, they can have a lot. Mine barely bother with their hay or grain when they have lots of greens and they do just fine. Baby rabbits that have access to greens from the beginning, when they first pop out of the nest box and begin tasting solid foods, should have no problems with greens. Also if the mother was fed greens while nursing, it seems to have gotten the kits to adjust early. They sort of “grow into them” as their taste for solid foods increases, just as with baby wild rabbits. A holder or manger is best to feed your natural feeds to your rabbits, but sometimes I just stack it in a clean front corner of the cage. They don’t mess it up if you feed them only as much as they can eat before the next feeding. You can also dry weeds and other plants in time of plenty for use in the winter. I did not get as much of that done last year as I should have and hope to do a lot better this year. I dry on racks and combine in tubs with grass hay I do not worry if the dryed herbs and greens are combined uniformly. I basically mix them and store in old grain bags or pillow cases ( Use the paper grain bags as they can breathe). I then have a small bin that I fill and keep in the barn with the feed (this gets used up fairly quickly). The seeds obviously want to settle to the bottom, so I give it (the bin) a shake to keep them mixed up. I make a Botanical blended hay for the winter rabbit “blahs” by mixing some of the regulators (plantain, raspberry, strawberry and blackberry leaves) with some dried fragrant herbs they love this stuff! You can dry things like rose canes, raspberry canes and weeping willow whips in bunches with the leaves on for winter use. Greens can simply be air-dried for winter, but in a damp climate you must ensure that they don’t go moldy. Mold appears on hay or greens as a white powdery coating that will get into the air when disturbed. Not good for either you or the rabbits! Good air circulation during drying and storage in containers that breathe are good. Use large onion bags or pillow cases you can also just bundle larger branches and hang to dry. Those blackberry canes with the leaves on should dry well, as will willow whips with the leaves attached. Smaller plants and wonderful weeds like dandelion, chicory, sow thistle, mallow etc. (see the SAFE FOOD LIST FOR RABBITS for botanical names just be shure you are harvesting the right plant).They can be dried on screens or in onion bags. Certain trees can be used as forage for rabbits and dried for winter use as well: willow and poplar are two that are excellent and easy to find. Their leaves are quite high in protein and the rabbits will eat the bark from small twigs and branches as well. Here ia a list of trees that I know are safe. These include: Alder, Birch, poplar, willow, sugar maple, silver maple, apple, pear, mulberry, sycamore, ash, hackberry, rose, and gooseberry are all good for rabbits. My rabbits love the tree branches! Especially when they are budding out. Any native safe listed tree branches are good for your rabbits, The rabbits will chew all the buds off, then peel the tender bark, then throw the stick around in their cage. So plant a weeping willow, They grow very fast and provide a lot of forage for the rabbits can also be used as shade for rabbits as well as a food source willow is high in protein, and very palatable to rabbits. How much to feed that is the toughest question? You will need to experiment. Give them what you think is about right. If there are leftovers, cut back a little. If it is all gone, increase it a little until you know how much they will use. There will still be some waste, but not near as much as if you just feed it free choice. Rabbits are funny what you have to give them NOW is far more attractive than the same item that is already in their hay rack or dish. If you visit them twice a day, feed them twice, but only half as much. They will enjoy it more and waste less. There are a number of unsafe/toxic food lists out there for rabbits, (also check our blog for POISONOUS PLANTS TO RABBITS) which one should be aware of when foraging for rabbits be shure to know what you are feeding rabbits! Oak leaves and pine needles in particular are tasty for the rabbits but not good for them Pine needles because they can cause tearing and internal lacerations if the rabbits don’t chew them fully and oak leaves, like apple seeds, can cause cyanide poisoning. The useful wild plants for rabbits include young trees, leaves and shoots. Clovers and vetches are legumes (but watch out some of their seeds are poisonous). The useful wild plants are: coltsfoot, comfrey, chickweed, cow parsley, docks, sorret (sour dock), dandelion, fat hen, groundsel, heather, Plantain, Shepherds Purse, sow thistle, watercress, bind weed, celandine, wild iris, fool’s parsley, henbane, and lettuce. White clover, Yarrow, and lots more! Dried plants saved from summer provide variety and extra nutrients. Still, rabbits crave fresh, green foods in winter. Rather then feed them expensive fresh foods from the store on a regular basis, try some of these ideas. GROW GRAIN GRASS: Fresh foods are nice for the rabbits and I buy some dollar store rectangular dishpans, put about two inches of soil in them and plant grain: wheat, rye, oats. I don’t bother with drainage holes. It’s the same idea as growing “cat grass” but on a larger scale. When the grass is about four inches long you can start harvesting it and you will get several harvests from one tub before it gets discouraged. Then just start over. You will want more than one on the go so there is always some grass ready to cut. SUNFLOWER SPROUTS: Another dishpan, this one planted with sunflower seeds. Start cutting them once they have true leaves or let them grow on for a bit. Replant as needed. POT UP WEEDS: A dishpan of transplanted weeds – especially dandelion and plantain – will give your rabbits tasty nibbles all winter. Try to find small plants as they are easier to transplant. Sprinkle on some of those dandelion seeds too, but they wil take much longer to establish themselves. FORCE TWIGS: Twigs cut from safe trees can be fed to the rabbits all winter long, They relish the bark and buds and it is good for their teeth. It should also be possible, however, to bring some twigs inside and put them in a jar with a couple inches of water. It will take a bit of time, but they will break dormancy and begin to leaf out. When ready to serve, remove the part that was sitting in water.It could have mould,or bad bacteria on it. I have fed my rabbits lot’s of natural feed sources for over my 30+ years of raising rabbits and have learned a lot! I am always looking for new ideas to feed rabbits without an outside food source, So any input or new ideas are welcome! I am planting more and trying new ideas all the time. I am now putting together some package of seeds and will offer them as a Rise And Shine Rabbit Garden These will be ready this January for spring planting I am also making up packets of fodder seed for rabbits so you can grow your own rabbit hay. Writing up posts for GROWING A RABBIT GARDEN and GROWING HAY FOR RABBITS to be ready with the seeds! I have been using Comfrey as a food source and tonic for a long time in my rabbitry. When I was young I always talked to all the old-timer rabbit breeders around my neighborhood and on my paper route. They all agreed and swore by comfrey as the best rabbit tonic and said every rabbit breeder should grow it. They would give a little each day added to their daily green feed, and told me this is why their rabbits never got sick. They told me it would prevent everything from snuffles to premature kindling and helping milking does produce more milk. I have no scientific proof, other than never seeing any of their rabbits sick. So that’s when I got my first few comfrey plants (cost me a weeks worth of newspapers) and I have been feeding comfrey to my rabbits ever since. I have moved many times from my childhood home but have always brought comfrey cuttings with me to plant more. I know that my rabbits love the stuff just by their reaction when harvesting the comfrey, the rabbits hear me cutting the leaves in the comfrey beds, I can hear them running and binkying around their cages knowing their healthy tonic is on the way. When entering the rabbitry with a basketful of comfrey, the whole herd comes alive waiting for their treat. I highly recommend comfrey for rabbits! It is a great digestive aid and will help with wool block, do not overfeed as it may cause diarrhea, this is the plant working use caution! Great as a tonic and added food source but not as the only feed source. You can cut it down and dry it like hay to store for winter use ( It can be cut down up to three times here in Maine). They also love the freshly harvested leaves. The plant has a calming effect on rabbits, also good when a rabbit is off feed, It will get them back on it! Comfrey is a great source of vitamin A and good for pregnant and nursing does as it also supports the immune system. Comfrey is good for the stomach, and can be fed as a general gut tonic. Always use caution when feeding greens to rabbits! Being extremey potent comfrey can have negative effects if overfed, and can cause diarrhea. When I do feed, it makes up about 25% of the basket of greens/weeds I pick every other day or so in the Spring/Summer/Fall. There are so many other uses for comfrey on the homestead. I will list just a few. Comfrey has long been used as a cure by Gypsies and peasant people for ever, it has an ancient reputation as a mender of broken bones! It has also been recommended for uterine and other internal hemorrhages and for the healing of wounds. Comfrey’s power to heal wounds is credited to a substance in the plant called allantoin (listed in Merck’s Index of Chemicals and Drugs for its use in skin ulcer therapy). The most common medicinal use of comfrey is in poultices to help heal swellings, inflammations and sores. British Gypsies would also feed the roots to their animals as a spring tonic. On my homestead all the livestock love it! The pigs go nuts when I throw it into their pens, The chickens come charging to meet me at the gate with some, And we already discussed the rabbits! You can also condition your soil with comfrey! It’s one of the best plants for this. The leaves themselves may be buried as “instant compost” to give row crops season-long nourishment. A tea can be made with the leaves and used as a liquid fertilizer (No more Miracle Grow!). You should google the uses of comfrey in the garden you will be amazed! There is to much for me to list here maybe I will do a future post just on comfrey and the homestead! Harvest when the foliage is 12 to 18 inches tall, we cut the leaves with a sickle by gathering a bunch together and shearing them off two inches above ground. After such a harvest, the plants will grow enough to be cut again in 10 to 30 days. About two weeks is the average in our experience. Dry the harvest or feed it fresh! The thicker stalks are had to dry and mold before drying, so for drying stick to the leaves. 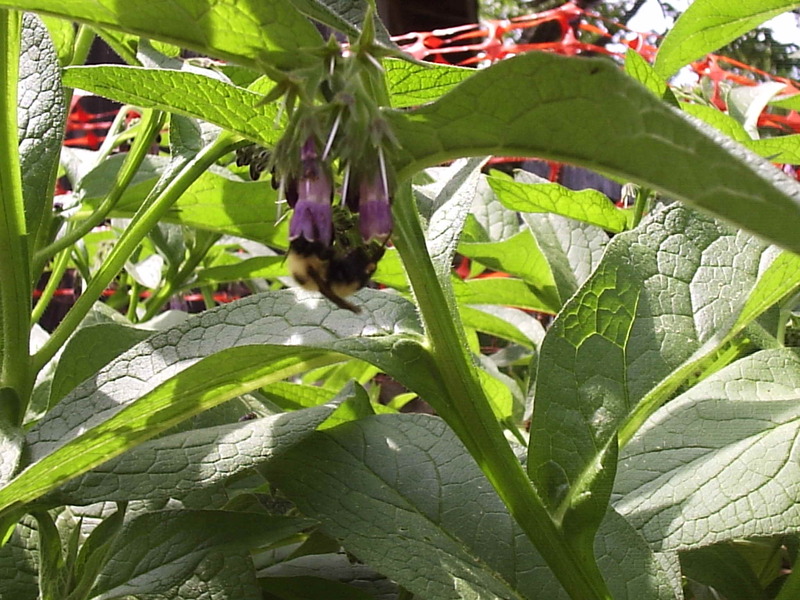 Comfrey is a controversial plant yet it has been used medicinally for at least 2000 years. It has also had extensive use as an animal feed just as long. Due to recent evaluations of this plant, it is important to learn about it before deciding whether or not to add it to your rabbits’ diet. I have used it before any of the studies and still use it to this day wit no ill effects! It irritates me how negative weighted research can affect the truth of an herb. There are three main varieties of Comfrey grown, Russian Comfrey(bocking strains), Prickly Comfrey, and Common Comfrey. Common Comfrey is the one usually grown here in the US. These Comfrey plants greatly differ in the amount of alkaloids present in the plants. I grow and sell the Russian Bocking 14 type. The research was done on young rats that were injected not fed naturally the whole food product. It is known that injecting a substance will often give a toxic reaction when just eating it does not. This test did cause tumors in the liver, but it was basically an overdose of the toxic part of the comfrey injected into young rats than are sensitive to the alkaloid to begin with. That is a negative weighted research project to say the least! Despite the controversy over Comfrey and liver toxicity, farmers in both Japan and in the Pacific Northwest plant fields of comfrey to feed both their dairy and beef cattle. These farmers are getting remarkable results in the health of both their beef cattle and increased milk production in their dairy herds. If comfrey is so dangerous, then why then is it not causing liver toxicity in these cattle? They are being fed enough to cause liver problems. There has been no problem with liver toxicity in their herds. So if you question the use of comfrey in your rabbitry do your research. I have butchered many rabbits and have never found any internal issues with the feeding of comfrey over long periods of time. JOIN THE RABBIT REVOLUTION! Like Us On Facebook and subscribe to the website for updates and post as the become available.